The only way to get your hands on a Nintendo Switch right now is to head over to Amazon, where you can pay a premium to have the Nintendo Switch with Gray Joy-Con or the Nintendo Switch with Neon Blue and Neon Red Joy-Con Prime-shipped to your door in two days. It’s impossible to find a Switch in stores, mainly because it’s awesome. Nintendo fans have been anxiously awaiting the Switch’s arrival ever since it was clear that the Wii U was a flop, and Nintendo really delivered a great product. From software to hardware, everyone adores this hot new console so far — though there is one area of the device’s hardware that many people would like to see improved. Have you ever pulled open the Switch’s kickstand? If you have, you undoubtedly cringed at the sound it makes, and you probably thought you were going to accidentally rip it right off. 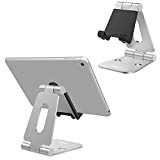 Don’t worry though, because you can fix this little hardware flaw with a Nulaxy Dual Foldable Aluminum Stand, which is currently discounted on Amazon. FULLY FOLDABLE & MULTI-ANGLE: It can be easily adjusted to your desired angle with your hand(270 degree). It can be fully folded to pocket-size which will save you plenty of space and make it easy to carry anywhere. UNIVERSAL COMPATIBILITY: It is compatible with 4 to 10 Inches devices like Nintendo Switch, iPhone 6 6S 7/7 Plus, Galaxy S8/S7/S6/Note6, LG, Sony, Google Nexus, iPad mini/pro/Air/Air 2, Samsung Tab , Kindle, even in protect case. PREMIUM QUALITY & ANTI-SLIP SILICONE PAD: The whole body is built solid and durable with aerospace aluminum. The anti-slip pad and feet works perfect to keep your devices in place while in use and protect your devices from daily scratches and sliding. ELEGANT DESIGN: The elegant design makes it look like a work of art which will add some stylish element to your table. LIFETIME GUARANTEE: If you are not satisfied with it, please feel free to contact us, we will offer you a FULL REFUND or new REPLACEMENT.